As anyone who wears jeans knows (so, nearly all of us), jeans attract their share of wear and tear, especially around the knees. Especially if you’re a mom, apparently crawling after your errant children through a dirt path sprinkled with broken glass and random nuts and bolts. What’s a somewhat fashionable mom to do? 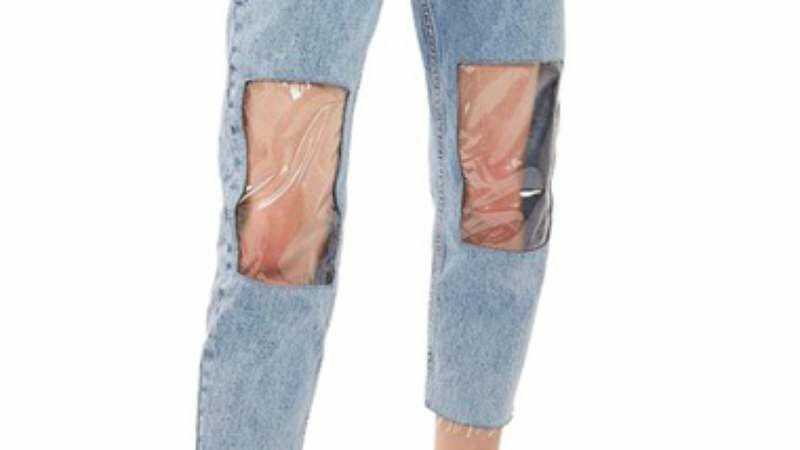 We’re not sure, but we’re just trying to piece together the possible thinking behind this latest fashion monstrosity from Top Shop by way of Nordstrom (c’mon, Nordstrom, we were really rooting for you), with the recent introduction of the “clear knee mom jean.” The retail website describes these $95 pants thusly: “Slick plastic panels bare your knees for a futuristic feel in tapered and cropped high-waist jeans.” Oh, it’s futuristic, all right. Like some kind of dystopian nightmare. If you do want to order these (for the worst Halloween costume ever, say), you may want to hurry: We have a feeling these might be completely disappearing from the Nordstrom website soon. But what do we know: Maybe plastic sleeves are next!